The second part of the adventures of the Pink Panther, whose voice was once again lent by Cezary Pazura in the Polish version. This time she has to solve the case of the mysterious events in the Chili Wa-Wa camp. A sequel to The Pink Panther: Hocus Pocus. This time around, we have to solve the issue of weird events in the Chili Wa-Wa camp. In the game, we get to visit many cities all around the world, such as Bombay, Cairo, London and Beijing. We shall climb the snowy peaks of Himalayas and travel the pastures of England. During our adventure, there are lots of characters to meet and each and every one is worth talking to if only to hear their comments. 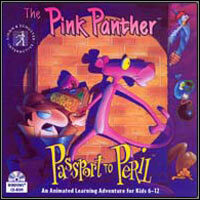 Much like the first installment in the series, The Pink Panther: Passport to Peril is meant primarily for the youngest players, but the older ones also may find elements that they like. Game score 8.7 / 10 calculated out of 419 players' votes.